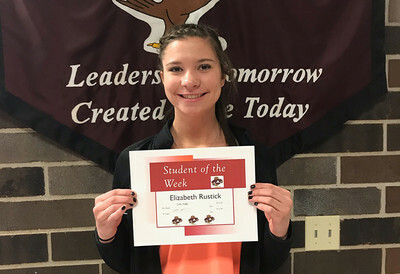 Elizabeth is a focused, hardworking student with a clear vision of what she wants out of life. She completes her work on time, and seeks out feedback in an effort to improve. She is a role model to others in class, and is always a pleasure to work with. 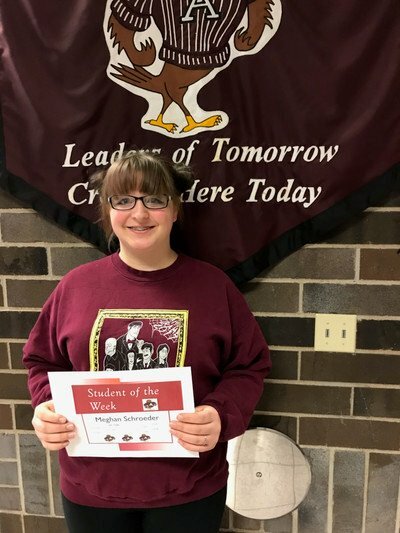 Her involvements and dedication to her academics make her an easy choice for Student of the Week. Aurora has been such a great help in class. 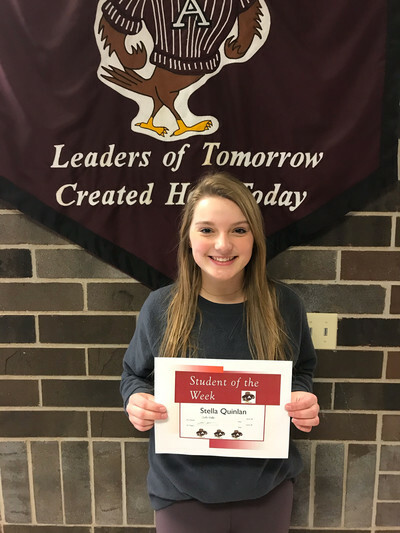 She goes above and beyond by helping a fellow peer in class with assignments and daily tasks. Aurora volunteers to do anything and is always willing to stay after class to help clean up. 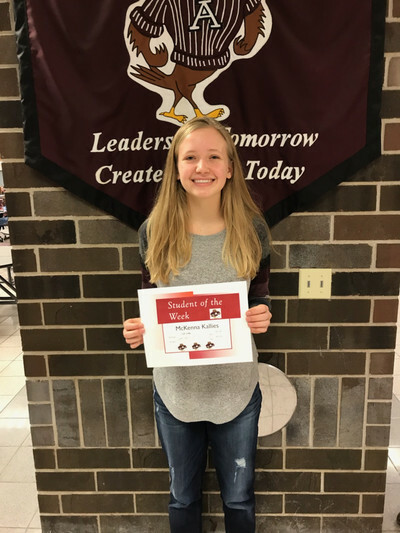 Aurora is a great example of Antigo Pride by going above and beyond in everything she does. Gretchen is a highly motivated student who works exceptionally hard. 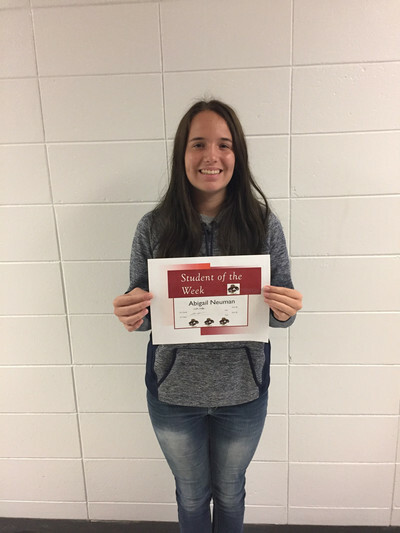 She excels in academics and shows great respect towards peers and faculty. In addition, she is very active and very helpful in FFA. What can I say - she's amazing! He is always helping in class without being asked. 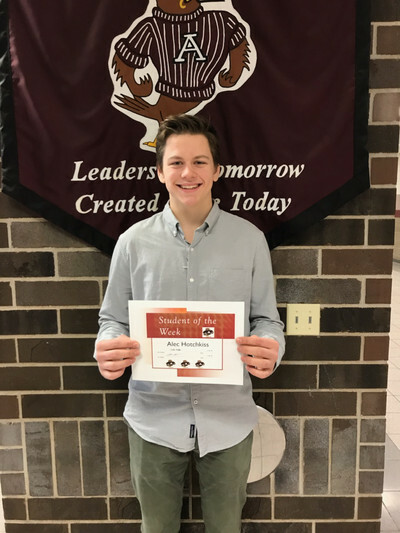 He has a positive attitude and is all around pleasant to have in class. He also works well with his peers no matter who he is paired with. Owen is a polite and courteous young man. He comes to class with a smile on his face and a positive attitude. He works hard during class and on assignments outside of class. He works really well with others and lends his knowledge and help to classmates. 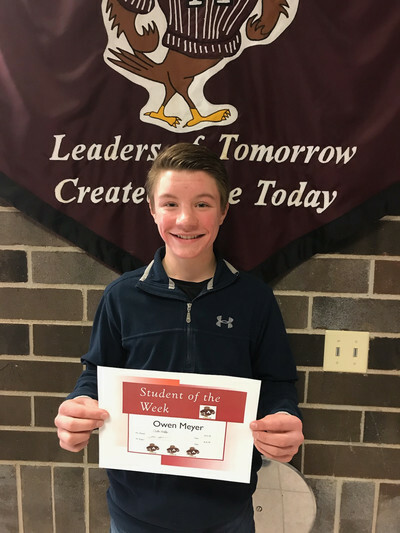 Owen is a positive role model for others! Michael has been very dependable this year and has done a great job in the Pit Band for the musical Cinderella. 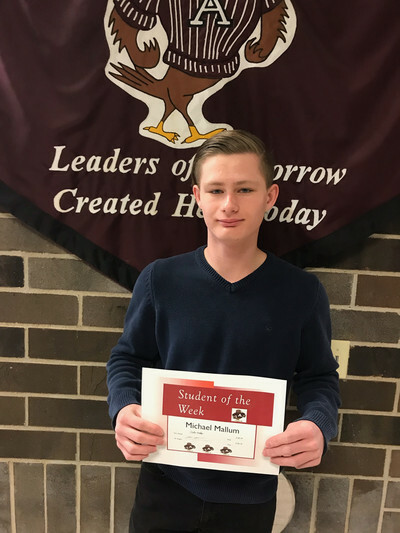 Michael is always polite and always works to do his best in band and choir. She is always happy during school. She is always willing to lend a hand with fellow students. 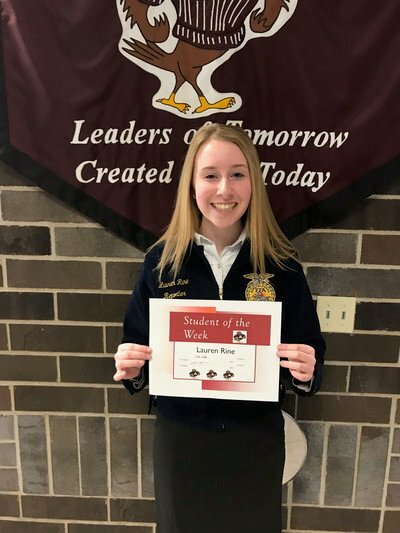 She is involved in 4-H. She is a positive influence for our school. Rebekah is a student in my Personal Finance class. She approaches class every day with the same enthusiasm and desire to learn. She is engaged in the classroom and asks questions that provide her with additional information so she is prepared to tackle financial situations she may encounter in the future. Rebekah is very conscientious of her penmanship and displays neatness in the completion of projects. She is an excellent role model for her peers. Sarah has overcome a lot of adversity in the past few years, but has shown her resiliency. 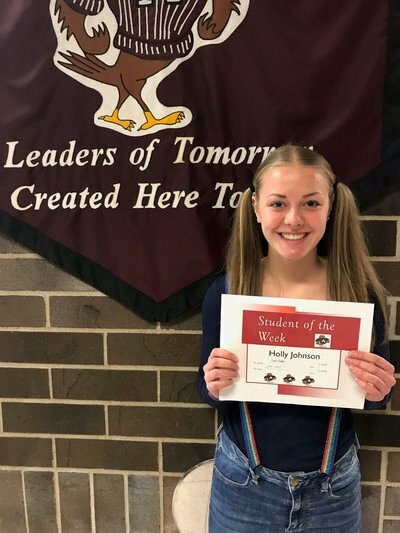 Throughout her senior year, she has continued to grow as a student and person. She is kind and respectful and continues to put in hours at her job outside of school. I am very proud of the student and person she has become! 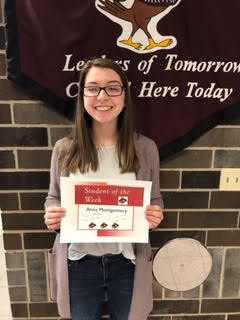 Anna is consistently taking a leadership role in our groups and has been instrumental in our development this year. 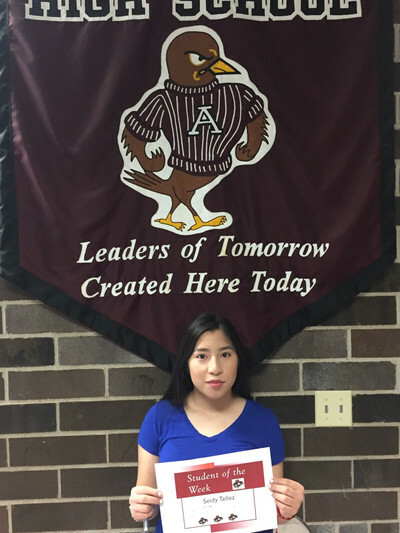 In addition, she is very polite and positive and has been very welcoming to all students. Erika is an outstanding student. She was always on time for my class and ready to work. 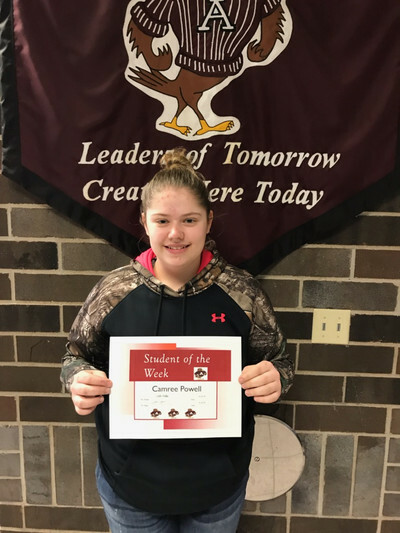 Erika enjoys coming in on her own time and going above and beyond classroom expectations to help get work done for our student run business. She is very polite and always asks if there is anything she can do to help out. William loves participating in aspects of school. He always has a smile on his face and is helpful to peers and adults. Abigail always does a great job of being engaged in class. I can always count on her to be a positive presence around her peers. It starts at the beginning of lunch with him making sure he thanks us and shows us how much he appreciates us. He has impeccable manners. He is always thanking us and offering to help us with chores in the lunch room. We talk about how sincere Devin's willingness is. It makes us feel appreciated. Ethan always conducts himself in a professional, polite manner. He has an excellent work ethic and takes pride in his work. These qualities were certainly displayed in his Civil War Project. Ethan is a fine young man who is a pleasure to have in class. Lauren is always respectful in class and is always prepared and ready to learn when she gets to class. 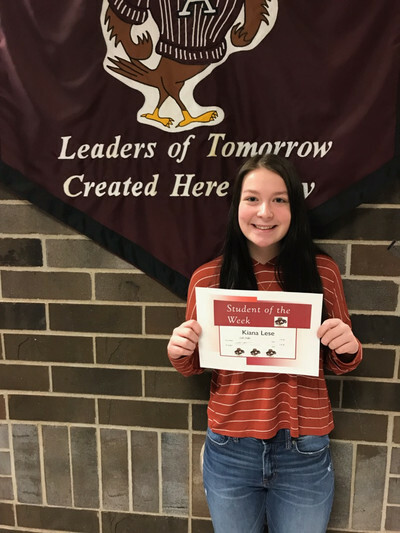 Lauren is always respectful and willing to help her classmates as well. Abi is a polite young lady. She is respectful and responsible and always willing to help others. 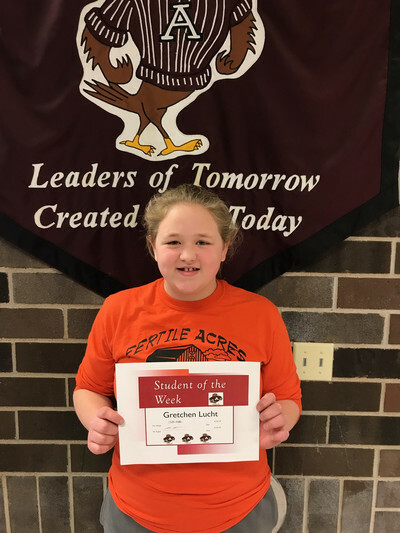 She demonstrates Antigo Pride each and every day. She is always positive and a pleasure to have in class. 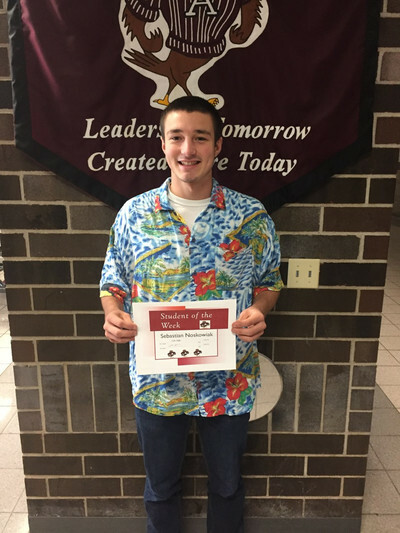 Alec is a pleasure to have in class, very responsible, always works hard and has fun with everything we do. 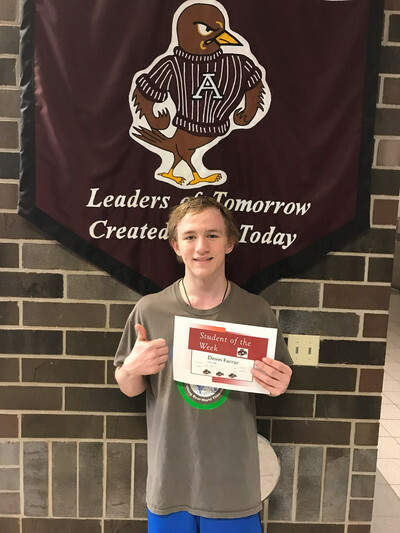 We have a choice everyday when it comes to attitude and effort, and it is just awesome to see a student chooses to smile, have fun, and be positive no matter what the day brings! 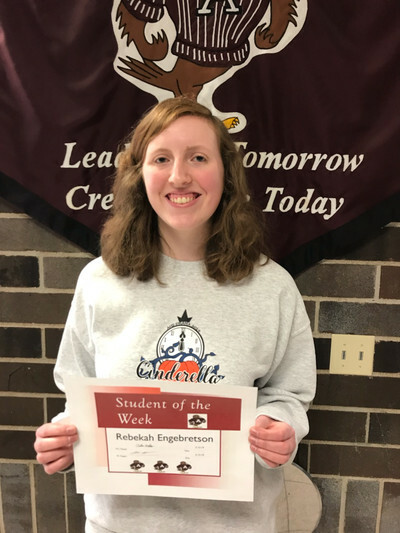 Meghan is a positive role model for all students at Antigo High School. She exudes the qualities of Antigo Pride and the 4 "Be's." One of Meghan's best qualities is her positive attitude. She is always pleasant to be around. Kiana is always willing to help other students that need it. She makes sure everyone in her group is working and on task. 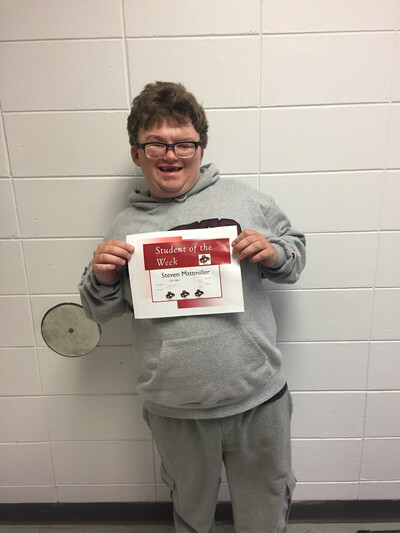 Michael has an excellent work ethic and a positive attitude. He does not give up when challenges arise. 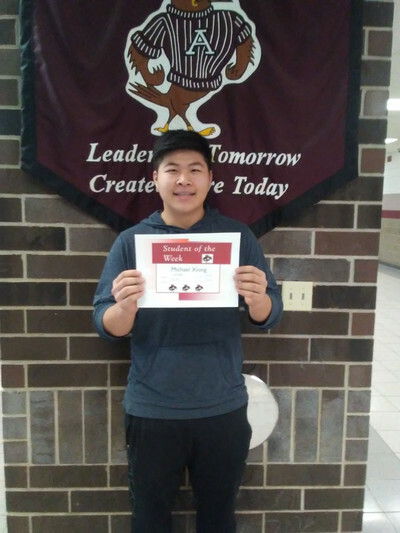 Michael became a leader in our automatic transmission assembly project. He takes initiative and is an overall great worker. Ashlyn is a model of Red Robin Pride each and every day without seeking any recognition for it, as she would say, "because it's just the right thing to do." That attitude makes her even more deserving of this recognition. 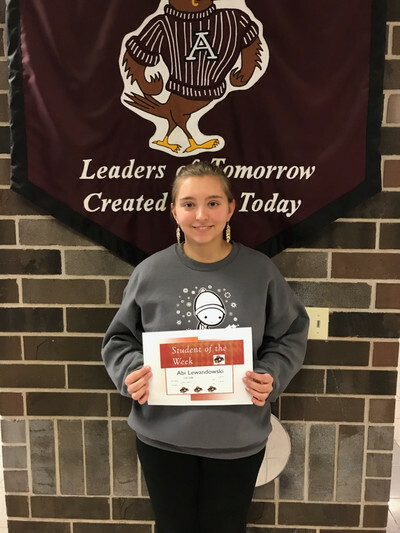 Ashlyn's perseverance fuels her success as she clearly understands the value of effort and hard work. 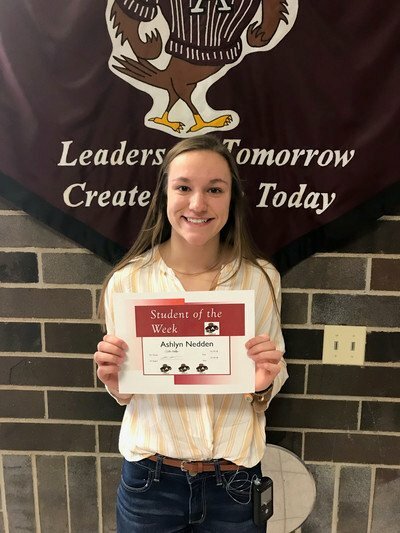 Ashlyn successfully balances rigorous academic courses, active co-curricular participation and leadership, babysitting, life-guarding at the Aquatic Center, and coaching a youth volleyball team with time for her family and friends. Well done, Ashlyn! Emma is a hard worker in class and strives to do well on any task assigned. 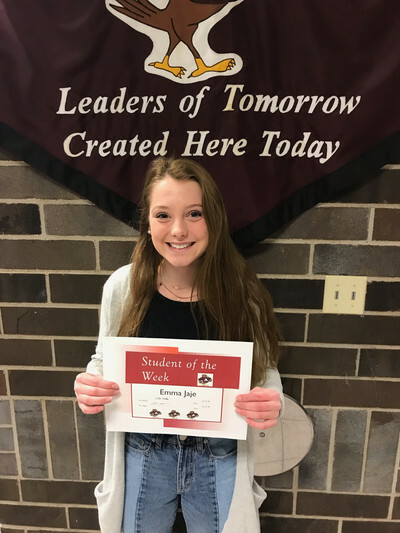 She is always willing to help out in the classroom and also shows a great deal of school outside of the classroom! She is a leader to others and has a positive influence on those around her! She also shows a great deal of support for our basketball teams here in Antigo! Thanks Emma and keep up the good work! Stella is an awesome student to have in my class as a new teacher. She is very respectful and polite to everyone. She puts in a tremendous amount of care and displays an amazing amount of pride in her work. She is always pushing herself, trying new things, and asking questions which in turn pushes those students working around her to improve their work along with her. 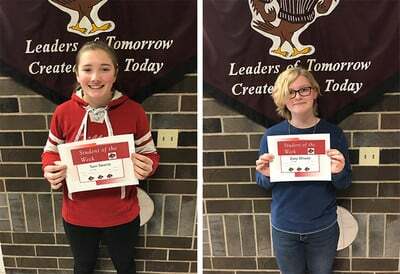 Sam and Zoey are amazing students to have. They lead by example by showing poise and patience in an otherwise hectic class. Furthermore, they are also very skilled in the German language and show great promise for the future. Tate's work effort is tremendous. 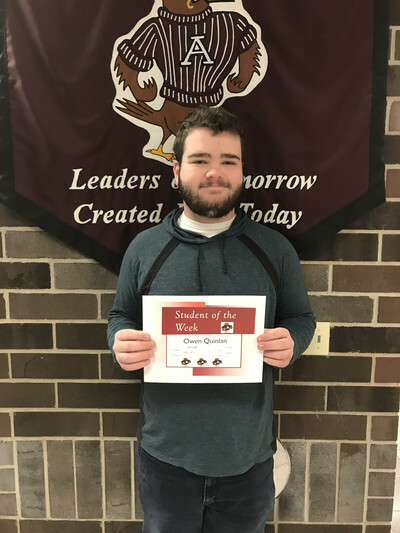 He is kind and caring towards other students, and he also listens and participates in class. Owen is always pleasant and in a good mood. He is very studious and has taken difficult classes to finish his senior year. He makes excellent use of his time. I have never seen him in a bad mood. Elyse takes her academics very seriously and puts forth the time and effort to succeed in my class. Her dedication towards learning is demonstrated by the questions she asks and the perseverance she shows towards understanding. She comes to class every day with a positive attitude and challenges herself to thoroughly understand calculus. Holly is an independently motivated student who values lifelong fitness. 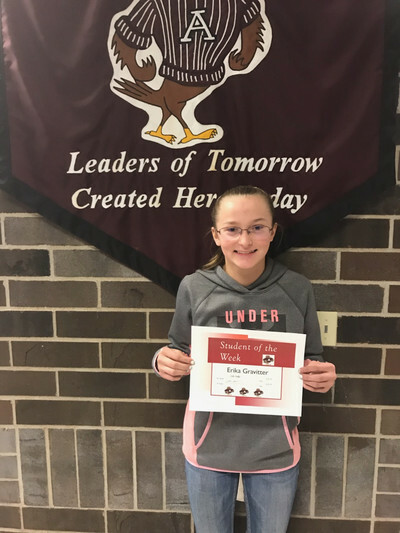 She sets goals for herself and works towards achieving them both in and out of Physical Education class. 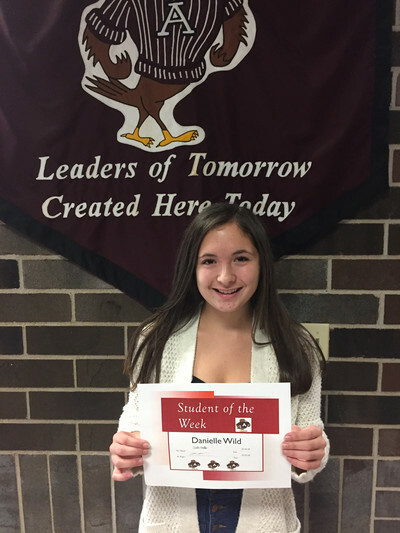 She is respectful of staff, kind to her peers, and is always responsible in and out of class. Her positive attitude is contagious and I admire her work ethic! Brenna is always prepared and engaged in class. She is not afraid to look into complex topics and dive deeper into the text. Her ideas enrich and liven classroom discussions, and her attitude motivates others to get involved as well. Anthony is a very polite young man who has gotten of to a very good start to his freshman year. 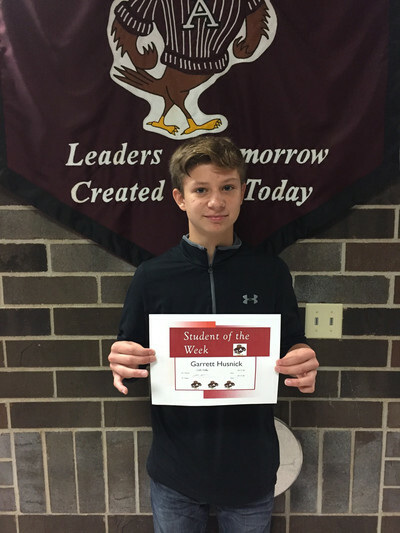 He is kind to others and is very responsible with getting his school work in on time. He is a very good example of our 3 B's student. Keep up the great work. Leo is always willing to go the extra mile. 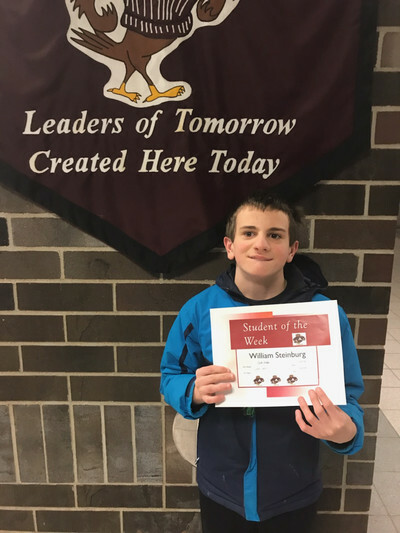 He is respectful and responsible in class and also in the hallways. Leo takes classwork very seriously and many times takes on a leadership role in class activities. 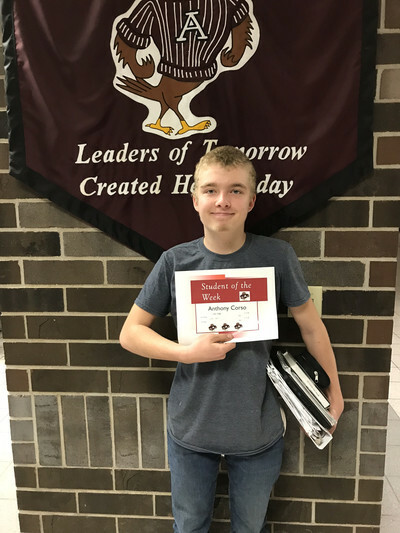 Leo is a great student to have in class and is a good role model for others. McKenna is an exceptional student. In class, she is kind, respectful, and hard-working. 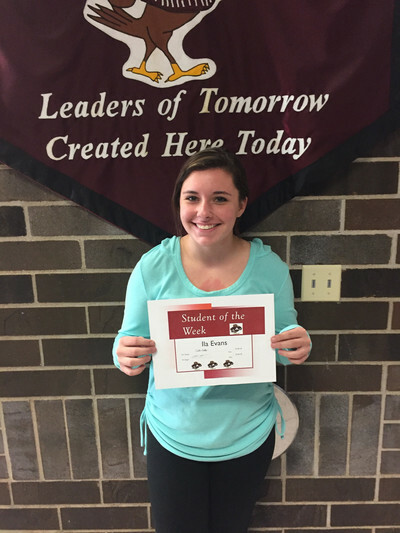 She helps others and puts forth effort throughout the entire class period. It is a pleasure to have McKenna in class. Ila is an exceptional student in my Children's class. Childrens is a dual credit class and Ila goes above and beyond to reach the college level requirements. Ila is always respectful and helpful with all students. She also has a very creative mindset that helps others make connects to the child care world. I enjoy having Ila as a student in any course! Lela is always prepared for class and is eager to learn new information. She exhibits an urgency to complete the assignments and does so with accuracy. When she is asked to help other students, she willingly assumes the challenge. Lela is a pleasure to have in class and positively impacts the dynamics of the entire class. 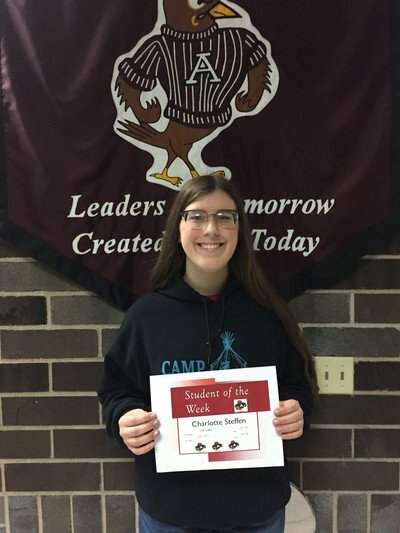 Charlotte passionately applies herself to all tasks, going above and beyond in projects with analysis, creativity and presentation. 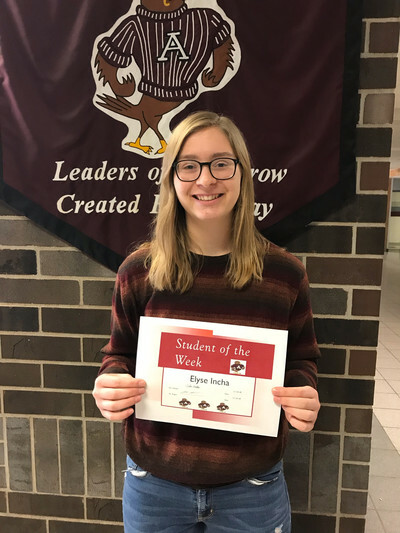 She models a safe oasis in students' days to express themselves in written and oral communication, as she expresses herself, as well, by sharing writing and thoughts on what we read. Charlotte shows positivity, humor and motivation in everything she does, and I hope she will keep honing her talent as a writer for years to come as it is a joy to read her work. Garrett is an extremely hard worker in class. He is willing to help his classmates and works well with others. It doesn't matter the task asked of him, he is always up for the challenge. 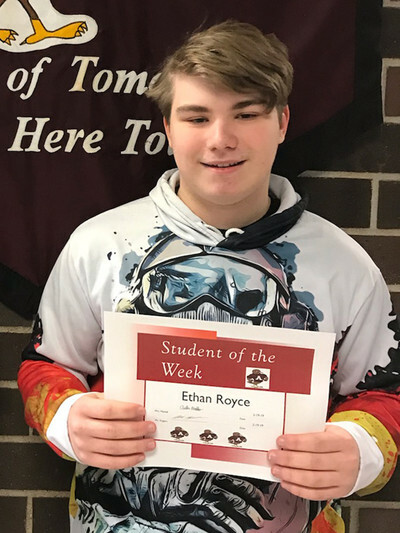 His positive attitude and friendliness to others makes him an enjoyable student to have in class. She always is very prepared for class and truly works to the best of her ability. 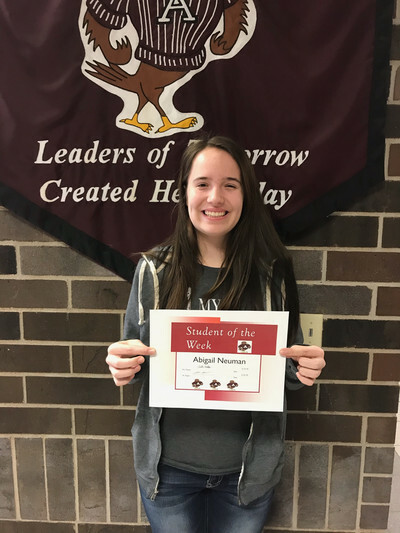 Dani is a very polite and courteous individual in the hallways, in our classroom and to everyone she comes into contact with. Further, she always brings a smile to class and is a joy to have in my American History 11 course. She truly encompasses the components of Antigo Pride. 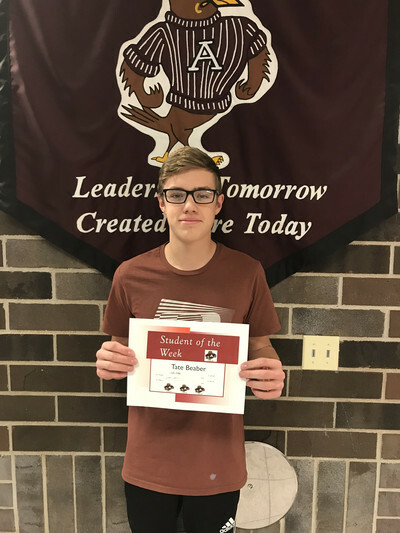 Ethan is off to a great start this school year - he continues to demonstrate growth both academically and as an individual. He is very passionate about his interests and one of his most admirable traits is kindness towards others. Thank you, Ethan! 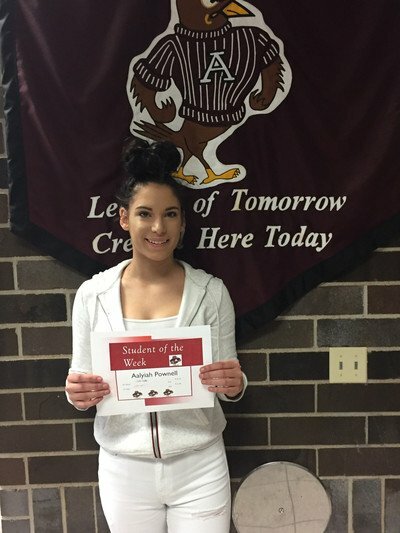 Abigail is a very positive and upbeat student and this spreads to others. She is always responsible and takes care of her responsibilities. She is also very helpful with anything that needs to be done. Steven has done a remarkable job recently with working in the community. His work ethic has been average but has done some tasks above and beyond what was expected. 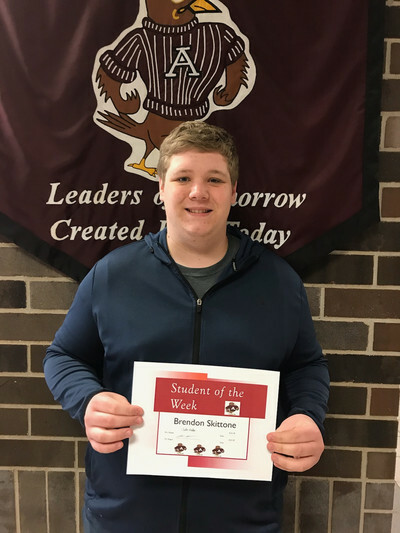 He has been helpful in the classroom when needed with situations that have gone on in class. 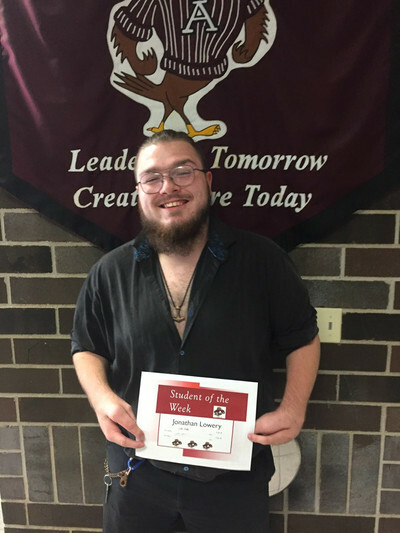 Finally, Steven is a very likable student who aims to please and receives complements very well. 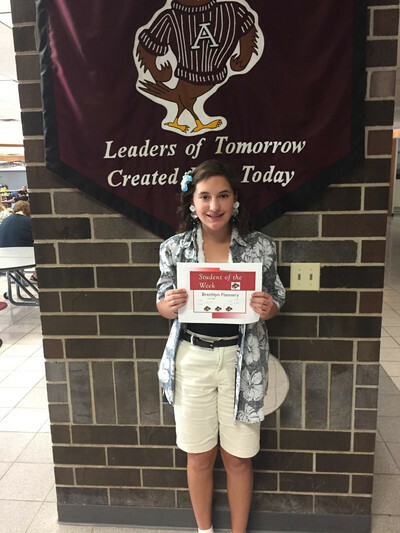 Brechlyn Flannery has already made an impression as a Freshman at Antigo High School. 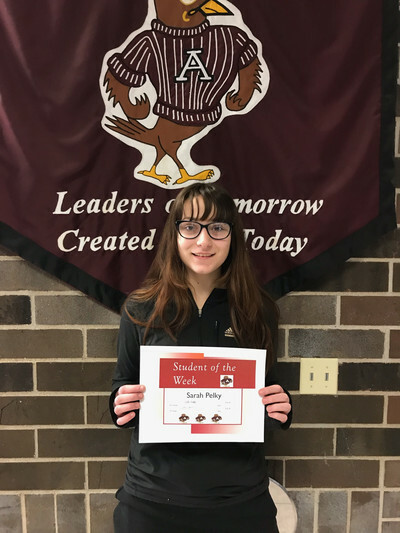 She does an excellent job of maintaining the AHS values for students, and has been especially helpful encouraging classmates to be successful. Brechlyn is willing to help her classmates to do, and be, their best in her World History class. She is both an example in her classwork and her behaviors. 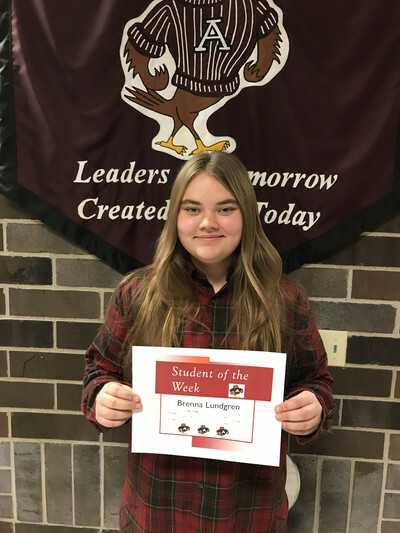 Thank you Brechlyn for your positive influence as a quality role model. The level of engagement/intellectual curiosity Jonathan displays helps energize the entire class. His questions are thoughtful and its obvious that he has a real desire to learn all that he can. Jonathan conducts himself very respectfully. He is a pleasure to have as a student. Sebastian is a great person to have in Spanish class. He is always participating and working to better his Spanish. 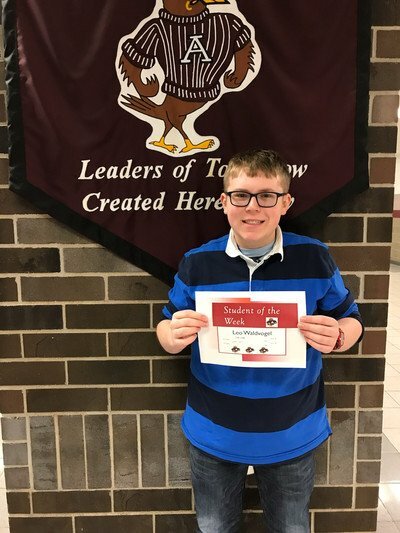 He is always at school earlier than most students and can usually be found helping others while he is here. I've never seen him be rude or disrespectful to any student or staff member and is well liked by everyone. 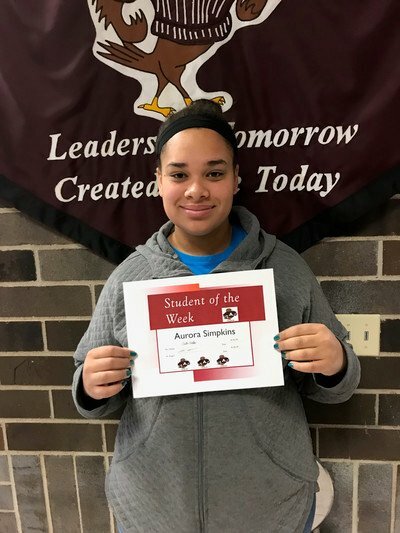 Aaliyah has had a great start to the school year. She came in on the first day of school to help with the 8-9 graders find their classes and help with the routines at with a new building. She has always been respectful to the teachers and gets along with her peers. It has been a pleasure to get to know and work with Aaliyah over her HS career thus far. Seidy is always working hard. She is constantly trying to improve. Not only that but she is also a kind and caring friend . Seidy is always a joy to have in class.